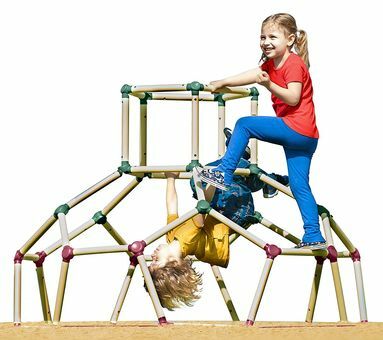 Lil' Monkey Dome Climber - The Dome has plenty of room to climb all over, hang off, swing and can also be used in role-play or as a den when covered with a sheet or two. If you child is a Monkey and climbs on everything then the Lil' Monkey Dome is a blessing and will get used daily for hours and hours and It will aid with their development and agility and ensure they get some exercise. Dome is designed for just the right height, It's not too big and it's not too small and is low enough to the ground that parents won't need to worry about their child's safety. The bars are made of sturdy plastic tubes, which are a PLUS because it is more flexible and safer compared to steel tubes. The Lil' Monkey Dome is UV protected virtually weatherproof and easily transportable around the back yard if necessary. Suitable for ages 3 to 6.